Manipur had trade links with other states since ancient time. It happens to be the trade routes between South Asia, South East Asia and Central Asia. (Kabui 1988: 11) The Neolithic culture of Eastern India has revealed that Manipur had close relations with Burma, China and other Indian states. The discovery of blue porcelain bowls, bell metal coins and guns, etc. in the excavation of the Kameng village and the palace of Maharaja Jai Singh also gave evidence of having relations between Manipur and other Indian provinces at various periods. (Annual Administrative Report of Manipur 1940-41). As native coin was circulated within the state only, external trade was done through barter system. The development of trade with Dutch, Portuguese and English by sea was reduced the volume of China export to Manipur through the hilly routes. (Ahmed 1981: 178-181) It is fact that China's trade with Manipur has brought about certain economic innovations like the introduction of silk and silk worm and gun powder. This is the influence of Chinese commercial contact with Manipur. This relationship could not last due to misunderstanding developed between the two kings. Marjit Singh permitted his people to cut teak timber in Kabaw valley which naturally offended the friend. Bagyidaw invited him to attend at the ceremony of his accession to the throne of Burma, but Marjit Singh did not attend on some excuse. King Bagyidaw ordered an expedition to Manipur with one hundred thousand armies under the command of Maha Bandula (Kamei 2015: 5-6) and the trade was suspended between the two states. The Thadou Kukis used to take salt, iron, ornaments, cotton, etc to Burma to exchange with cane and bamboo products at Yazagyo, an important market in the Chin Hills of Burma. (Roy 1973: 59-60). The important item of export of Manipur was raw silk. Moreover, finished clothes, the leaves which cover the cob of maize which was used in making cigarette were also exported to Burma. Manipur was self-reliant in her traditional economy, but she had commercial contact with the other Indian states. The neigbhouring Indian states with which Manipur exchanged goods are Assam, Cachar, the Naga Hills, the Lushai Hills, Tripura and Bengal. However, the traders of Manipur had closer contact with Cachar because the Manipuris used to exchange goods for the products of other states mostly through Cachar. There was trade with Tripura and Manipur. 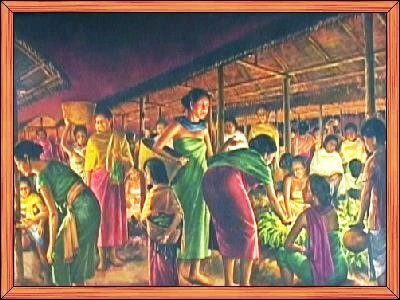 During the reign of Khagemba, there was trade with the people of Tripura whose influence was extended over Cachar and northern Mizoram. (Kabui 1991:215). After observing the above facts, one can say that Manipur had extensive trade relations with Southeast Asian countries even before the British occupation. Since the external trade was conducted through the hilly routes, the volume of trade was found to be limited. Another difficulty was that when Manipur was at war with some other countries the external trade of Manipur disturbed during the period. But, since the product of Manipur itself served almost all the necessities of Manipur, the people suffered scanty even when Manipur stopped its external trade. This clearly indicates that Manipur had self-sufficient economy in the pre-British period. The above routes were used by the people of Manipur and other kingdoms since ancient time. Pilgrims, immigrants, and traders travelled these routes. Laden animals and ponies were the main means of transportation. This article was posted on March 10, 2017.